The Sedona has always been a rather popular minivan among drivers, but it has really started to gain notice with its stunning redesign that it received for 2015. 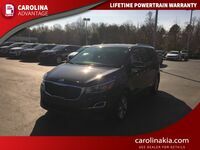 With how popular that model was, its understandable why not much was changed for the 2016 Kia Sedona in Greensboro NC. The vehicle returns with its aggressive exterior and stylish interior, along with more options than ever before for drivers to take advantage of. 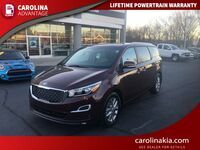 Powering the 2016 Kia Sedona in Greensboro NC is the familiar 3.3-liter V6 engine that excellently blends performance and efficiency. The engine cranks out a pulsating 276-horsepower and 248 pound-feet of torque. It is paired with a six-speed Sportmatic automatic transmission that provides stunningly smooth gear shifts and allows for optimal acceleration. Don’t expect and uncomfortable transmission jerks or power lag when you’re driving the 2016 Kia Sedona in Greensboro NC. With the fresh redesign of the 2016 Kia Sedona in Greensboro NC, drivers once again will get a wide list of comfortable amenities to choose from inside the vehicle. The “First Class” lounge seating is once available in select trims which allows for a more comfortable ride in the second row, including retractable footrests. Leather and Premium Nappa Leather seating trims are also available for added comfort, as are heated seats. Other interior features that drivers are sure to appreciate in the 2016 Kia Sedona in Greensboro NC include a tri-zone automatic climate control, an Infinity Surround Sound System, UVO eServices, and more. All of these can be chosen to provide the driver and passengers with their ideal minivan. As far as advanced safety technology goes, the 2016 Kia Sedona in Greensboro NC is packed with it. A rearview camera now comes standard on all 2016 models and that is just where the safety technology gets started. Other sensor based technology can be selected for your Sedona, depending on the trim level. So what safety technology is there? 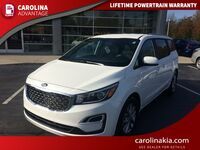 A parking assistance system, surround view monitor, blind-spot detection system, rear cross traffic alert, smart cruise control, forward collision warning, and lane departure warning system are all of the ones optional in the 2016 Kia Sedona in Greensboro NC. We aren’t saying this vehicle can drive itself, but these changes will certainly help prevent accidents from occurring.